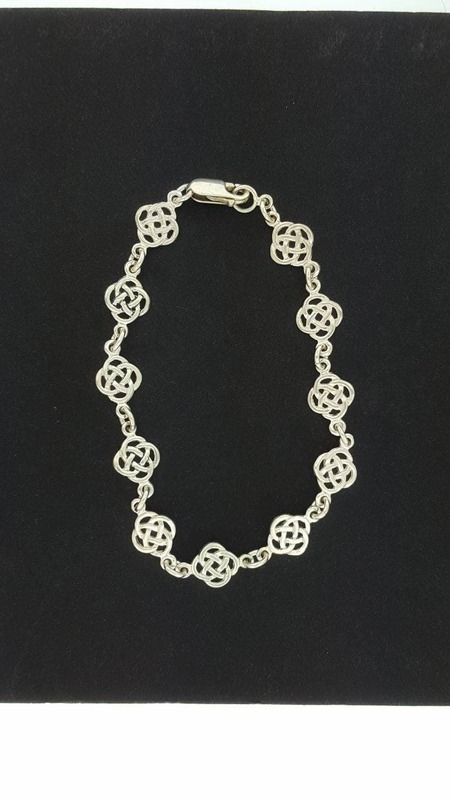 This handmade 0.925 sterling silver bracelet is an endless knot measuring 0.8cm wide links connected with jump rings and a lobster claw clasp. The links are 2.5mm thick. I make it as long or as short as you need. I make each bracelet as ordered when ordered. But don't hesitate to request a specific size. The endless knot or eternal knot (Sanskrit: Shrivatsa; Tibetan Dpal be'u) is a symbolic knot and one of the Eight Auspicious Symbols. It is an important cultural marker in places significantly influenced by Tibetan Buddhism such as Tibet, Mongolia, Tuva, Kalmykia, and Buryatia. It is also sometimes found in Chinese art and used in Chinese knots. It can be found on temple walls, in paintings, even Japanese sword guards. The endless knot has been described as "an ancient symbol representing the interweaving of the Spiritual path, the flowing of Time and Movement within That Which is Eternal."